The DC Health Benefit Exchange Authority (HBX) is a public-private partnership established to create and operate DC Health Link, Washington, DC’s state-based online health-insurance marketplace. 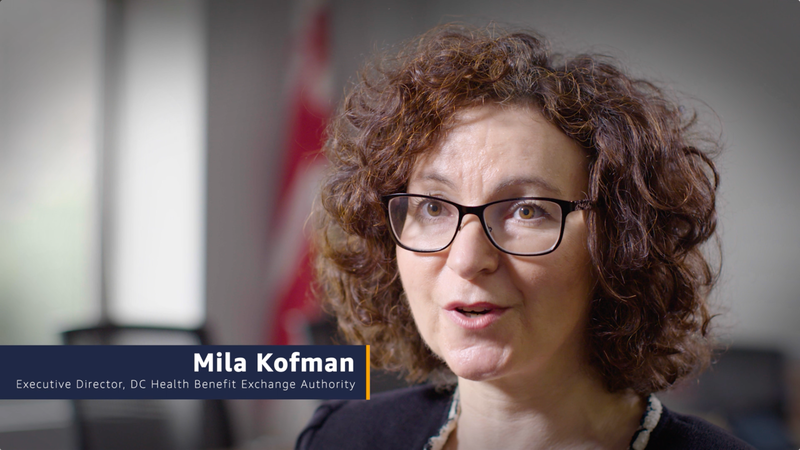 The DC Health Benefit Exchange Authority (HBX) uses AWS to instantly deploy software to deliver enrollment-as-a-service solutions for healthcare customers, save $1.8 million annually, and meet stringent compliance requirements. The organization offers an online health insurance marketplace for small businesses and residents in the District of Columbia. HBX runs its primary solution on the AWS Cloud and uses AWS Marketplace to acquire and deploy software for additional solutions. Small businesses have often struggled to provide a wide selection of health plans to their employees, but DC Health Link—a public-private partnership established by the DC Health Benefit Exchange Authority (HBX)—helped change that. DC Health Link offers a range of coverage choices to District residents and small businesses. In 2018, DC Health Link has more than 150 indivitual and small-group health plan options offered by CareFirst, Blue Cross Blue Shield, Kaiser Permanente, Aetna, and United Healthcare. These include health-maintenance organizations (HMOs), preferred-provider organizations (PPOs), and plans compatible with health savings accounts (HSAs). DC Health Link has also helped cut the District’s uninsured rate in half; more than 96 percent of District residents now have health coverage. A spring 2016 survey of DC Health Link customers found that 25 percent of people in the individual market were uninsured prior to enrollment, 50 percent of people eligible for Medicaid were uninsured prior to enrollment, and 4 out of 10 small businesses did not offer coverage to their employees prior to introduction of DC Health Link Small Business (SHOP) Marketplace. The fourth DC Health Link open enrollment, which ended January 31, 2017, resulted in nearly 24,000 residents selecting private health plans for coverage—more new customers than either of the past two years. At the end of 2017, more than 75,000 people were covered through the DC Health Link Small Business (SHOP) marketplace. Similar to other state-based marketplaces and the federal marketplace, DC Health Link initially used commercial off-the-shelf (COTS) products. After the initial build, however, HBX faced millions of dollars in annual licensing fees for COTS products. Change requests cost hundreds of thousands—and at times millions—of dollars due to the complexity of changing hard-coded software. Product development cycles were six to twelve months or longer. Code upgrades and changes required the entire code to be redeployed and the marketplace to be offline in maintenance, which meant customers could not use the marketplace while the system was down. System capacity was low, resulting in system timeouts and other obstacles to enrollment. HBX’s experience through the first two open enrollments led it to conclude that continued reliance on its COTS products would not be sustainable. These products were not flexible enough to meet evolving business requirements, were expensive to maintain, and were not scalable. In 2015, to help achieve sustainability and a customer-centric online experience for SHOP and individual marketplace customers, HBX began migrating the DC Health Link IT system from traditional data centers to an agile, cloud-based model using open-source code with no licensing fees. HBX was the first state-based marketplace to migrate to the cloud, and it is still the only such marketplace in the cloud. The agency’s approach was recognized as innovative by the National Academy for State Health Policy. HBX chose to move to the cloud using Amazon Web Services (AWS) because it offers the ability to develop software and new features rapidly, meet federal security and compliance standards, and contain costs. HBX uses a variety of AWS services, including Amazon Simple Storage Service (Amazon S3) for secure file storage, Amazon Macie for data-security services, Amazon Route 53 for Domain Name System (DNS) service, AWS CloudFormation for cloud service provisioning, and Amazon Relational Database Service (Amazon RDS) for database services. HBX also takes advantage of Amazon Elastic Compute Cloud (Amazon EC2) Auto Scaling, which enables HBX to quickly scale computing capacity to meet changes in demand while only paying for what it uses. AWS Service Catalog gives the organization centralized control over cloud configurations, which can be quickly deployed for different users. HBX obtained AWS-compatible, third-party software and tools through the AWS Marketplace, and used the AWS Partner Network (APN) to tap into the growing local technology corridor to retain qualified software developers with knowledge of agile development and cloud services. HBX used three key strategies to transition to the flexible, cost-effective, and financially sustainable solution required to meet its broad mission with limited resources. These included: adopting open-source software standards and agile development techniques, shifting from capital-intensive, fixed infrastructure models to nimble, scalable cloud services, and building a platform conducive to a shared-services model that would allow HBX to share the costs of continuous platform improvement with other partners if the opportunity arose. HBX’s decision to replace its initial COTS-based IT platform with a customized, open-source code solution hosted in the cloud has proven successful and has enabled the agency to improve IT operations and services while lowering costs. HBX is saving nearly $1.8 million annually by using cloud hosting and services, in addition to saving $250,000 annually that it would have paid for data-center space to meet the federal 10-year record-keeping standard. Using an agile cloud-based approach and open-source code allows HBX to speed its development cycles and make frequent changes without taking the system down. Finally, using the cloud enables HBX to meet Federal CMS MARS-E 2.0 security standards, an important compliance mandate for all State Exchanges to protect data privacy. Since deploying the new system, HBX navigated two open-enrollment periods, handled two congressional open seasons, grew enrollment in the SHOP marketplace from 20,000 covered lives to more than 75,000, and deployed a fully functioning, customized version of the platform for another state’s SHOP marketplace. HBX has also deployed best-in-class decision-support tools. Additionally, HBX makes continuous improvements to its solution, with new deployments occurring weekly without the system having to go down. The agency was able to do this while winding down down its federal grant funding and keeping the industry-wide assessment that funds the Authority at the same one-percent level. Recognizing the IT solution HBX built, another state online-marketplace provider chose HBX to provide its new SHOP IT solution in February 2017. The provider had conducted two private-sector procurements and extensive analysis of the available state partnership options before determining that HBX’s solution surpassed anything offered by the private sector or elsewhere. HBX and the state provider entered into the first state-based marketplace partnership in the nation. HBX deployed the IT solution—with customizations such as rating areas and composite rates—in August 2017 and has provided business support since then. Under this partnership, HBX and the state provider share operational costs for the SHOP solution. This partnership also means HBX and the state provider will share the cost of future improvements and required federal changes. In June 2016, AWS awarded DC Health Link a Best Practices in Innovation Award. In January 2017, DC Health Link was ranked number one among public marketplaces for its online consumer-decision support tools. Most importantly, its customer satisfaction is up and call volume and escalated cases are down—three metrics considered by HBX to be key success indicators. The HBX open-source cloud solution is a model with enormous potential payoff for the public sector, because it demonstrates how agencies can align their IT environment with their mission and customer needs by using cloud services, which provide the flexibility to react to ever-changing priorities and are cost-effective to deploy and to maintain.